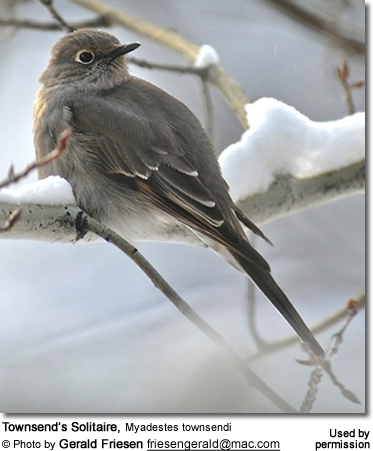 The Townsend's Solitaires (Myadestes townsendi) are also known as Townsend's Flycatchers, Townsend's Thrushes or Townsend's Ptilogonys. These long-tailed, short-billed thrushes occur naturally in western North America where they inhabit woody mountainous areas. These grey songbirds are best known for their melodious, flute-like vocalizations. 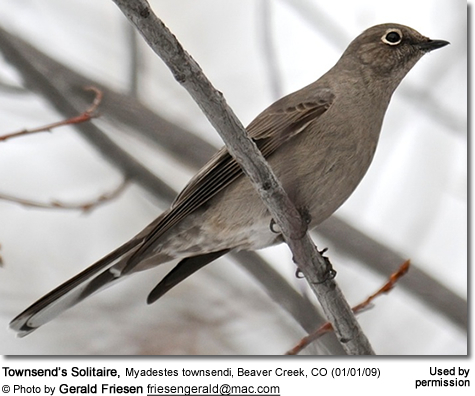 Its northern, and nominate, race is the only member of the Solitaire genus to occur north of Mexico. As implied by their names, these birds are usually seen alone, where they will aggressively defend a patch of junipers or other sources of berries. 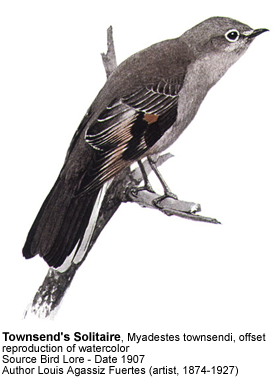 This species' common name commemorates the ornithologist John Kirk Townsend. These Thrushes occur naturally in the North American Rocky Mountains range - from southern Alaska through British Columbia and Alberta in Canada, and western United States - south to northern Mexico. They are for the most part resident (non-migratory) and inhabit montane woodlands (especially around junipers). However, during the winter months, they may move to lower elevations and eastward in search of food. On occasion, they have even been reported in desert oases. They are typically seen perching in an upright position on a high branch. 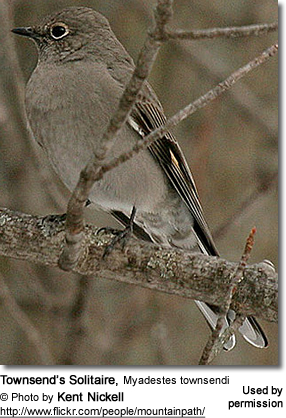 Northern Mockingbird: Similar size and shape, but lacks the white eye rings. The female Mountain Bluebird can be identified by the shorter tail, blue markings in the wings and tail, and lack of buffy wing patches. 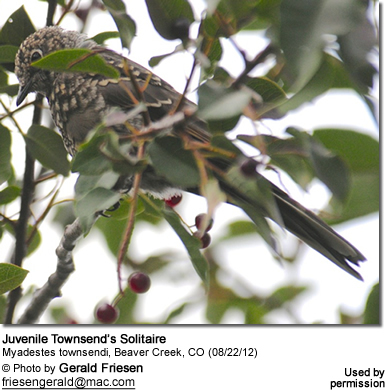 During the breeding seasons Townsend's Solitaires feed on insects, spiders and some berries. During the winter, their diet consists largely, or possibly exclusively, of the female cones ("berries") of the Juniper Trees. These birds are very territorial and aggressively defending productive patches of juniper trees against other birds. The size and the quality of their feeding territories often determine whether or not they will survive harsh winters. Breeding birds require a higher percentage of protein in their diet - particularly when feeding nestlings that need protein to support their rapid growth. Insects are often caught from a perch in mid-air or picked off trees or off the ground. Most nesting occurs from May through July. A nest may have 1 to 6 eggs; however, mostly 3 - 4 eggs are laid in a clutch. The eggs vary in color from dull white to pink, greyish-white, or greenish-blue - with numerous brown spots or blotches (concentrated at the round end). The cup nest is constructed using plant material, such as pine needles, found in their environment. It is lined with soft grasses, strips of bark and is placed on a platform of twigs on the ground or close to the ground. Depending on the habitat, the nest may be found on a cliff under an overhang or other nooks or hollows with some sort of shelter from the above. The hatchlings are naked except for some patches of down. They are completely helpless and depend on parental care and protection for their survival. Their songs consists of loud, melodious flute-like vocalizations with rising and falling notes. Their calls are described as squeaky eeek or "clear, soft whistle heeh".